This is my second post. I like getting such expert advice on my first entry, so I thought I would try again. Comments are appreciated. It was taken at the Wakatobi resort in Indonesia. The camera was a Nikon D200 with a Sigma Subal 18-55 lens in a Subal housing, with an Ikelite DS125 strobe was used. Photo from profile are rarely great with trumpetfish. The light seems to be ok, but I don't like the background (confusing the fish). try to shoot from ahead, keeping the full body in the photo and focusing in the head ? has great colour and the exposure is bang on. Yep, tough subject - I've still not taken a pic of one I liked. Your exposure, focus, and color look great. I do find the background distracting - maybe shoot up to put it against blue water, or set DOF to blur it out. Might also try a vertical format, to catch these guys hanging head-down. Thanks for the feedback. 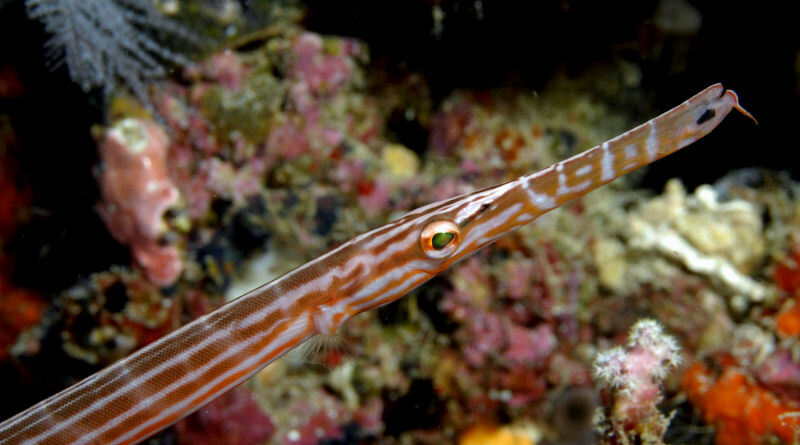 It is the best shot of a trumpetfish I had taken, so I thought I would get suggestions for improvements (maybe shoot other fish?). In answer to the earlier question, it is cropped. Try portrait instead, I think looks better. Not sure which one, possibly commersonii? Edited by AllisonFinch, 11 June 2015 - 05:41 PM. Amazingly sharp. Looking forward to seeing more as well! The shot is interesting. Though this fish is rarely taken in profile I love this one. Photo aspects aside - as they have been covered, I'm pretty sure it's a trumpet fish. The photo clearly shows a number of characteristics that identify it as such. It has a chin barbel, rows of fine scales and a laterally-compressed mouth. Also, the eye is comparatively smaller (eye diameter as a % of S.L.) and less oval in shape. Cornet fish, on the other hand, lack a chin barbel and scales - rather, they are either scale-less or have rows of hard plates in the skin, and the mouth is somewhat dorso-ventrally compressed. The eye of a cornet fish is comparatively larger and much more oval in shape when compared to a trumpet fish. In terms of the photo - either is challenging to get an engaging shot of! I'd echo the comments on exposure and focus - nice job!